Boyds, Md. 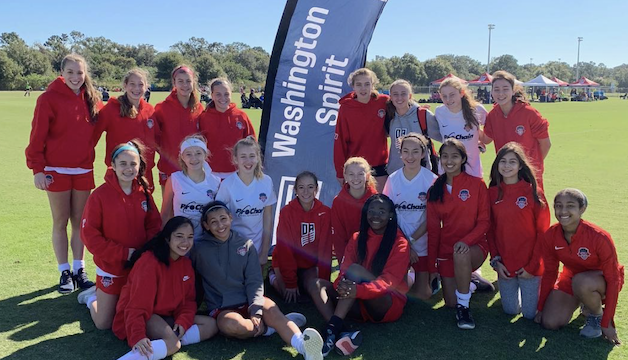 (December 10, 2018) –The Washington Spirit Academy Maryland and Virginia programs both showed well at the U.S. Soccer Development Academy Winter Showcase in Lakewood Ranch, Florida over the past week. The Maryland U-15s went undefeated during their Winter Showcase campaign, scoring 10 goals and conceding only five. They kicked off their showcase with a 2-1 win over Placer United, highlight by Cate Shepherd‘s brace. The U-15s kept rolling in their second contest, a convincing 3-0 victory against Midwest United FC in which Taylor Jendrek, Shepherd and Hoi Ching Luk all found the back of the net. In their final and most exciting game, the Spirit MD U-15s won 5-4 over So Cal Blues. The first half saw both teams score three goals as a brace from Shepherd and a goal from Dani Todd kept the game level. In the second half, Shepherd opened the scoring and completed her hat-trick, followed by a game-deciding Asia Minor goal in the 74th to seal the win. Shepherd led the team in scoring with six goals in three games. The Spirit Academy – Virginia U-15 squad had their best result of the showcase come in their first game of the competition, a 5-0 rout of South Florida Football Academy U-15 team. After going up 1-0 on a goal from Abba Kodiaga, the Spirit Academy scored four goals in six minutes, two apiece for Grace Carter and Taylor Daly. Kodiaga would go on to score two more goals in the Spirit Academy VA U-15’s 3-3 against Albion SC U-15, bringing her total to three and earning the leading scorer title for the squad. The Spirit VA U-15s, went on to finish the competition with a 1-1-1 record. The Spirit Academy MD U-18/19s’ Jordan Canniff had a game to remember as the squad took on the LA Galaxy San Diego U-18/19s and came out on top in a 6-3 shootout. After a Leyah Hall-Robinson goal to start the scoring, Canniff took over. Canniff found the back of the net five times in 51 minutes for the Spirit, ending any chance of a comeback effort by the Galaxy U-18/19s. Canniff was the leading scorer for the Spirit Academy MD U-18/19s with her five goals, and the team finished the competition 1-2-0. The Spirit VA U-18/19s were also in action during the Winter Showcase as they picked up a 2-0 against Placer United Soccer Club and a 2-1 result over Lamorinda Soccer Club’s U-18/19 squads. Gabrielle Robinson led the team with two goals over their three Winter Showcase games, of which the Spirit VA U-18/19s finished 2-1-0. 📸 sights from yesterday's 2-1 win for our U15 Academy – MD at the #DAWinterShowcase!